SERVICE: "I was with the air force. I was a general hand and served in New Guinea in World War II. "I was everywhere really, I went to Goodenough Island, the Milne Baye, then Finchhaven and Madang and back. I was 15 months over there." "They'd give you everything to do as a general hand, we'd handled bombs, fuel, ammunition, including Japanese bombs. We'd capture them, and they'd ship them up the coast to us and we'd fix them back up, and send them back to the Japanese." ON ANZAC DAY: "I come to meet my mates, I'm come out pretty well every year I suppsoe to meet up with the other fellas that I know or got to know." "There was nobody from here was with me, although an army fellow who had been my neighbour ever since I was little, he was in sixth division a couple of miles down the coast and I never knew he was there." SERVICE: "I did my National Service Training in Wacol at Brisbane. We did annual camps at Singleton and were on the reserves with the 41st battalion at Grafton drill hall for three years. "I never served overseas, but I was with them between 1953-56. National Service was an infantry battalion so we were regarded as footsloggers." "There was a possible conflict in Malaysia in that time so we were always prepared for that. I thought it was excellent, the variety of training we got and comradery that was formed. ON ANZAC DAY: "I feel because with our second war diggers diminishing in numbers as far as maintaining the numbers in the march. 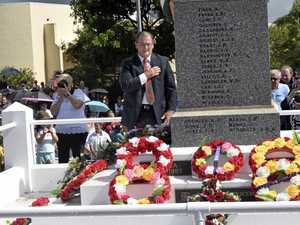 Since they've allowed ex national servicemen to be members of the RSL sub-branch it helps keep them functioning too." SERVICE: "1st battalion infantry with army in Vietnam. I was there in 1968/69. I was conscripted, I worked in a bank before that." "It was good and band, mostly good because of the mateship you had with the other people, but you know, there are lifelong memories from that and we generally catch up once a year and meet up with old comrades. "We did 10 weeks basic training then we did another six months or so more training and then we went to Vietnam." "Our base was in Nui Dat, we operated out of there, and we were flown by helicopter into wherever the fighting was." ON ANZAC DAY: "For me, Anzac Day is remembring my fallen comrades that didn't make it home. It's to get a chance to reflect on those people and then afterwards of course you meet up with your friends, have a few drinks and share that bond." SERVICE: "I served with 1 battalion and 6th battalion in the army infantry in Vietnam. We started just out of Saigon and when 1 battalion left I joined 6th and we ended up in Nui Dat." "I was a regular army, I was in for six years but I was out in four. Over there, you grew up fast. I was only 19 when I went over so it sort of opened my eyes." "When we were there, you never slept, you were sort of - if a twig broke you'd be awake, and you slept with your rifle all of the time. It was an experience I'll never forget. "We were in Operation Bribie, and they had us penned down and we could get out. They fought well, they had twice the ammunition that we had. In that operation they took tow hours to get the APC's in the jungle was so thing, and they got there we opened up on them, and they came back with twice as much and took one of the APC's out and we had to set fire to it right there. Those are the things you'll never forget." ON ANZAC DAY: "Anzac means you remember those that didn't come back that died. They put their life on the line and nevere came. We lost 521 back there, and I had some of them shot right beside me, and you don't forget them." SERVICE: "I served with the army in Vietnam, I was six years as a regular soldier." "I was 19 when I went over, and I have a lot of bad memories, but there are a lot of good memories. You know, good mateship, like it's been 50 years and I still go out and have reunions with my mates." "There was a real comradeship, you have to rely on the bloke next to you and you have to look after his life too - that's how you form that bond. ON ANZAC DAY: On Anzac Day we're here to pay respect to your lost mates and get in touch with the mates you served with and other servicemen and women. I think it's important, especially for the kids - they need to know what went before them. SERVICE: "I was in the Navy from 1966-68. I went to Vietnam when I was just 17 as an engineer, anything to do with mechanical we did it. "I was on the Sydney, which was a troop carrier, our job was to get them there and get them home." "There was comradeship, but it was harder for us blokes, we were an unit like the army guys, obviously I knew a lot of blokes, but every time I went to a different ship or base it was different people and different attitudes to go with that." ON ANZAC DAY: "It's about being with your mates, and it's good to see the kids and peopel coming and listening to the service to realise what they've done." "I think we're losing it a bit, I don't think people realise what's happened and why we've got some a good thing in this country. It's good that so many people come so they know what happened in years past."